I play on a Yamaha tenor sax with Vandoren Java 2.5, a Selmer clarinet with Rico Reserve 3 reeds, and a Selmer bass clarinet with Rico Reserve 3 reeds for classical and Vandoren Java 2.5 tenor reeds for jazz. Why did you begin studying music? All my life, my house has been filled with the music of John Coltrane, Benny Goodman, Clifford Brown, Miles Davis, and other major jazz artists. When I was about 9 years old, I went to the Rochester International Jazz Festival because my parents wanted to see a concert by some jazz dude. That night, Sonny Rollins was performing in Kodak Hall at the Eastman School of Music (the major hall for the festival) and I watched how much fun he seemed to be having and loved the way he sounded on that “brassy thing with the keys” and have been saying ever since that I wanted to play like him one day. I was determined from then on that I was going to become a famous musician. I started Clarinet in 5th grade, and bass clarinet in 6th grade. My music teachers wouldn’t let me have a saxophone no matter how much I begged, then freshman year, one of the tenor saxophonists in our jazz band had to drop, and my teacher let me borrow a tenor to try expecting me to fail at it, and now it’s my favorite instrument to play. And that’s basically how I got started with jazz. What are you doing with music now? At the moment, I am pursuing an advanced diploma in jazz tenor sax at the Eastman School of Music. I am in a latin jazz ensemble run by percussionist Freddy Colon and a combo run by the pianist for the Mambo Kings, Richard Delaney. Also, I am in my school’s top jazz band on tenor sax and the top classical band on bass clarinet. I am also taking courses in transcription and jazz theory at Eastman as well as being part of the clarinet choir. My influences are primarily Joshua Redman, the Mambo Kings, Dave Brubeck, Sonny Rollins, John Lennon, Frank Sinatra, Ella Fitzgerald, and Eric Dolphy. Also my band director who is an outstanding jazz musician, Bill Tiberio. Who have you studied with? I have studied with Nancy Boone (bass clarinet), Amy Oldfield (bass clarinet and clarinet)and Mark Kreshevick (tenor and alto sax). I currently study with Dean Keller (jazz bass clarinet and jazz tenor sax), Doug Stone (jazz tenor sax), and Alan Woy (clarinet and bass clarinet). What would you like to do with music in the future? In the future, I hope to double major in music performance on clarinet and jazz studies on tenor saxophone. Post-college, I would like a job with the New York Pops and to have a band that can play at some of the Jazz at Lincoln Center venues. Basically, I want to be a performer. I can’t imagine living without music. Music is my life, it’s the reason I want to get out of bed and go to school. Most kids leave a lesson without thinking of the assignment they were given. Me, I go home thinking “ok, so how can I expand on the concepts I just learned?”. I am that nerd that will do anything to get the chance to just play music. I don’t care what others think of me because of it. I am band geek and am not afraid to show it. I have a Yahama Alto Sax and an International Woodwind Curved Soprano Sax. I always loved the saxophone’s sound. In fifth grade when I was offered to take either band or choir, my mom wanted me to take choir because my brother did it. I begged and pleaded her to let me learn saxophone and take band, so eventually, she gave in. I am in my school’s marching, concert, secondary, and jazz band. I practice every day in class and at home. My band director, Michelle Boyce, my section leader, Joseph Olmstead, and my best friend, Holly Woerner. I have taken band for five years now, and over these five years, I have had three directors. The first two were awful, and didn’t take the class seriously. Now, I have an amazing director, who has become an inspiration, and friend. I plan on following my director’s footsteps, and doing marching band in college and becoming a director myself. Yamaha 875 black lacquer tenor and alto, Rheuben Allen curved soprano, Rheuben Allen baritone saxophone See the rest of my setup here. I began studying music because I was inspired by a performance by the music faculty at my elementary school. Each of the teachers from the district came and put on a performance playing several of the instruments that were available to us and I took the band signup sheet home that day and begged my parents! I am currently performing, touring and recording every chance I get! Anything and everything! As long as I’m doing music, I’m happy. I really enjoy recording and spending time in the studio, but I also love being on the road so anything that allows me to either or both of those things would be ideal. 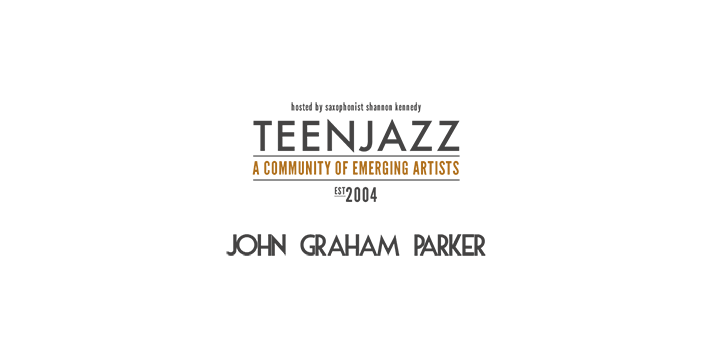 I run TeenJazz.com and TeenJazzRadio.com, I have several albums released – you can check them out on iTunes, CDBaby. Any and all proceeds go to continuing Teen Jazz! To start out, I want to let you know that I have been playing the same setup on my alto for several years now. Even when I’ve changed my mouthpiece, reeds or ligature, I have always tended to go back to my Beechler mouthpiece, Rico Plasticover Reeds and Ishimori ligature. No matter how much I may have enjoyed different products, I’ve always ended up being more comfortable with my sound and performance on the equipment I’ve been using for most of my music career. Recently, however, I came across a ligature that has given me reason to change my setup – and I am more than happy that I’ve made the switch! 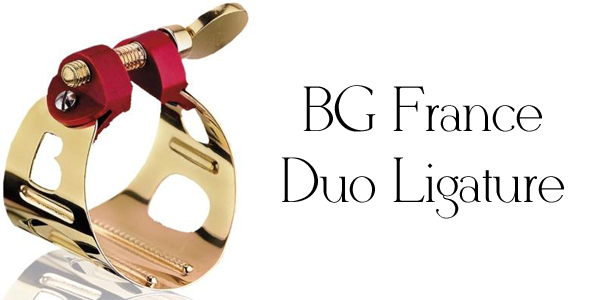 BG France’s new ligature, the “Duo Ligature” is hands down the best ligature I have had to opportunity to play for either jazz and classical setups. At first, I was skeptical. When Franck Bichon played me the demonstration videos for the ligature, I thought it was too good to be true. There was no way the ligature would do all the things the video claimed it would, but I have been of fan of BG France products for some time, and so, I decided to give the ligature a try. I have to admit that I was a bit hesitant because of my experience with my then current ligature (the Ishimori) which constantly slipped. It had minimal reed touch points like the Duo ligature, but each time I adjusted my mouthpiece, the ligature would move, and in result, my reed would shift out of place. I was constantly readjusting the placement of my ligature and reed, but I dealt with it because I was content with how it played and sounded. Little did I know that I could have better response and sound from a ligature without the hassle. The first time I played with Duo ligature was during a practice session. I noticed a difference immediately and couldn’t wait to use it during a performance later that week. The result during the performance was identical – I was able to play with less resistance, greater ease and I was elated with the result. Unlike most equipment changes I’ve made, I never reverted back to my older setup. I still play the BG Duo Ligature and I recommend it to anyone looking for a way to open up their sound and facilitate playing for either saxophone or clarinet. 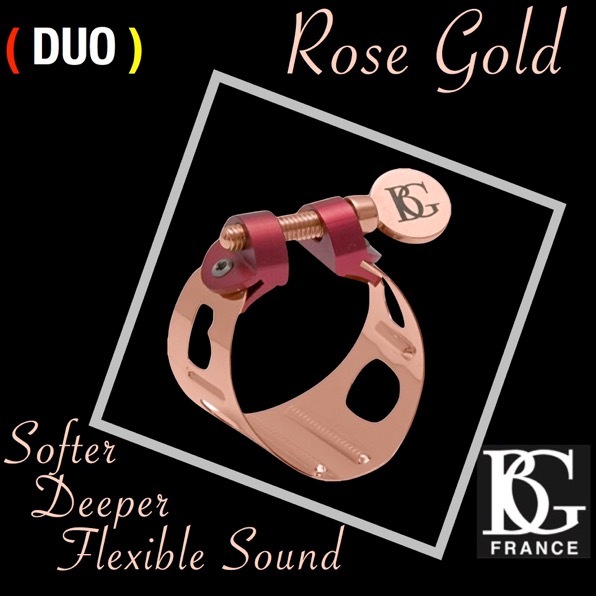 Visit the BG France web site to learn more about the Duo Ligature. This is a guest post from James Barrera, saxophone instructor at Cal State University Long Beach. Having been involved with younger sax players for well over a decade now, (yes, a few grey hairs have shown up) I think one of the most confusing, and important thing in a high school age musician’s life are their college auditions. As soon as you make the decision about whether or not you may be interested in pursuing music at a university, begin your research. Unfortunately, there is not as much information exists about Music Schools as Law Schools, Medical Schools, or other areas of study that can be found in the US News and World Report College Guides. Begin your search with your local colleges and expand to out-of-state. Look on the web for audition requirements; most schools break down their requirements into three groups: those that require a classical audition, those that require both classical and jazz, and finally those that only require jazz. This may heavily influence your decision on what schools to apply to. You can be sure that schools that only want to hear classical will require you to study fundamentals of saxophone performance, and those who only want jazz will require you to focus on the study of improvisation and jazz style. The vast majority of schools will require a classical and jazz audition. Having sat in on many of these types of auditions let me tell you this, we can tell if it’s thrown together. Ah yes, I can see it now, the brand new copy of the Ferling etudes, the barely used Selmer C*, and the box of reeds still in the cellophane wrapper. If it’s a month before your audition and you are just beginning to think about the classical component… well it’s really late. 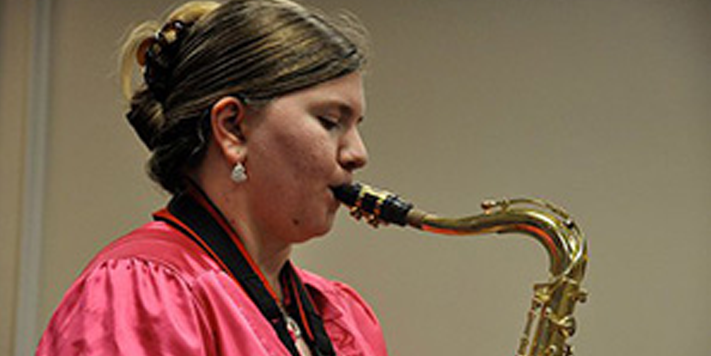 The ideal candidate for college has put in a significant amount of time working on classical saxophone style. (Purity and evenness of tone, clarity of articulation, and rhythmic accuracy.) If you do have time, and you teacher is willing, choose pieces from your state honor band audition requirements, or solo/ensemble list. (See below) If time is short, don’t bother with a sonata or concerto; just go with the 48 Famous Studies by Ferling. These are the international standard for saxophonists and you will definitely be studying these in college. For the jazz portion you will most likely need to play a couple tunes, blues, various scales, as well as complete some kind of ear training test. Be sure to prepare all Major, Minor (Harmonic), Diminished, Whole Tone, and Chromatic scales. You should to be able to play them at a good clip, sixteenth notes at M.M.=60 would be ideal. When you improvise, make sure you’re improvising. Nobody wants to hear the solo you wrote down and memorized. You won’t fool anybody either, they’ll know if you can play changes or just transcribed a solo off somebody’s album. Have a friend play you chords and then outline them on your sax, and play the appropriate scale that goes with that chord. You may be asked to do this in an audition. Don’t always believe what is posted on schools audition requirements, they may just decide at the last second to ask you to play a scale or exercise not listed. Sometimes a teacher may give you a brief lesson to evaluate how you react to instruction. Think of two or three questions for the auditioners, it doesn’t matter what you ask, it will demonstrate your interest in attending their school. Finally of all the advice I could give you the most important is this; look like you know what you’re doing. Look and dress the part, shake peoples hand, look them in the eye, speak to them with confidence, in other words… Be a Pro! Repertoire for Baritone Saxophone at the High School level is not extensive and what is available is of questionable quality. To be honest you would be better off playing a piece for Alto Saxophone, or a Bassoon or Cello transcription. I always recommend Ferling Etudes. So you’re looking for a new mouthpiece and you’ve found the process to be overwhelming. The selection is enormous and you just don’t know where to start. If this sounds like you, then you are in the right place. This article is here to help you simplify and de-stress (as opposed to distress) the mouthpiece purchasing experience. There are a lot of things to consider when looking at a new mouthpiece – the tip opening, the tone chamber, the types of materials used to make the mouthpiece, the length of the lay, etc. – these are all important things to think about when choosing a mouthpiece. 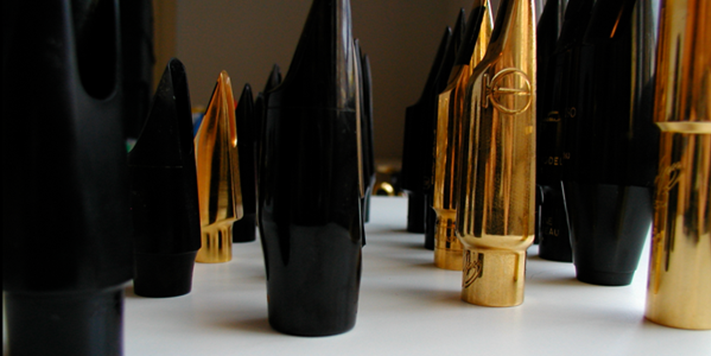 Plastic mouthpieces tend to be the easiest to play or begin on because they are not very resistant. Hard rubber mouthpieces tend to promote the fundamental sound of the saxophone, with a little bit more resistance than the plastic mouthpiece. Metal mouthpieces create a kind of “laser tone” – the can enhance the power and volume of the instrument and also help achieve the overtone series. The bore size of the mouthpiece also changes the response of your mouthpiece. Bore sizes are usually defined as small, medium and large. Small bore mouthpieces enhance the higher frequencies of the sax, giving the player a brighter sound. Small bore mouthpieces are best used playing lead over other saxophones or soloing over a large group. Medium bore mouthpieces creates a sound that more easily blends with an ensemble than a small bore, but still allows the player the volume to solo with a group. 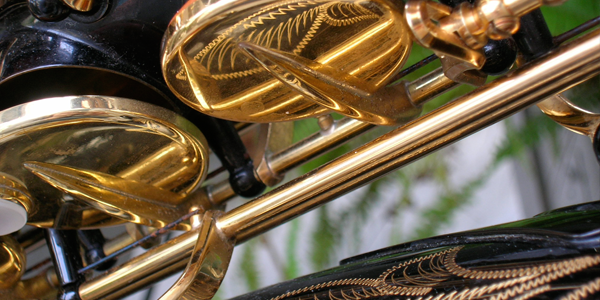 A large bore mouthpiece gives the saxophone a darker sound which is best for classical saxophone ensembles. Although the design of the mouthpiece gives it its own characteristics, the most important part of mouthpiece selection is the player. No two saxophone players are exactly the same, so what works for one person might not work for you. Therefore, use what you are comfortable and happy with – don’t go get something because it is what someone else uses. It also helps to bring someone along with you when you’re trying out mouthpieces. Another musician and/or your teacher can offer their thoughts on your sound and the quality of the mouthpiece and their input can be invaluable when making that kind of investment. When playing jazz, think of swung 8th notes as a triplet subdivision. Accent downbeats (not heavily, but enough to help with the time and feel). With difficult passages, this will help you maintain a steady pulse. Tongue with the middle of your tongue, not the very tip. Always touch the pearls on your keys with your fingertips; don’t let your fingers “fly” around. Sit with proper posture (no slouching, crossed legs, or leaning back). Take full breaths and control your air from your diaphragm not your chest. Practice everyday (even if it is only for 15 minutes). Blow Strong, constant, fast, full air. Keep a firm embouchure and open your throat when you play (for jazz). Think in terms of voicing the notes. Sing a high note and pay attention to the shape of your throat and mouth. Sing a low note and do the same. Try to recreate those positions when you play low and high notes on your instrument. At least clean the inside of your saxophone after use if you don’t feel like cleaning the entire instrument. Don’t leave reeds on your mouthpiece (it ruins your reeds and your mouthpiece). Dry your neck and mouthpiece out after use. Wipe down the outside of your instrument, that is, unless you want the lacquer to wear. Take your horn in to be checked by a professional repair person every six months. Get too soft if used for too long. You can soak your reeds in mouthwash to clean them after use. Try rotating two or three reeds at a time to give them a longer life. It also ensures you always have a backup reed that’s already been broken in just in case. 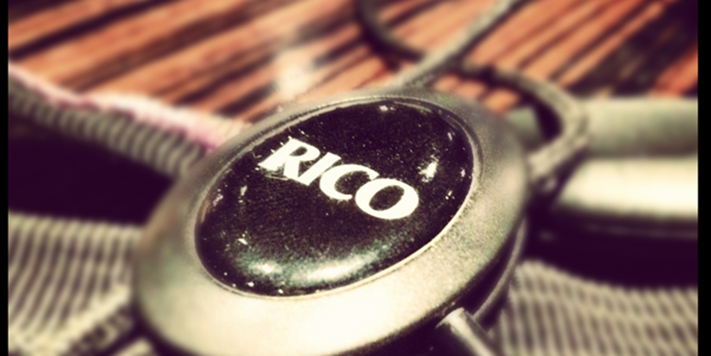 Listen to music as often as possible and to as many different performers as possible. Steal ideas from everyone – it is how you build your music vocabulary (I am not endorsing copyright infringement). Transcribe solos – technology now allows you to slow down songs so they are easier to learn. Take advantage of it! Practice with a metronome. Time is a continuum – you can’t change it, stop it, or catch up to it – so don’t try. Just keep it. Practice as often as possible. Practice things you can’t do, not things you can do. Practice scales – major, minor, pentatonic, blues, and chromatic (for beginners), whole tone, diminished, and augmented (for high school and college). Learn them one octave first, then play them full range and all 12 keys. Learn etudes – they help your sight reading, technique, and musicality. Mouthpiece exercises – try to create a consistent tone with just your mouthpiece. Soprano pitch is C for classical, Bb for jazz, alto pitch is A for classical and F# for jazz, tenor pitch is G for classical and E for jazz, bari pitch is D for classical and Bb for jazz. Long tones – always play with a tuner and practice all ranges (low, high, middle). Vibrato – done by moving your tongue as if saying “ya-ya”. Be careful not to overuse vibrato. Overtones – are good for developing flexibility, voicing, intonation, and altissimo. Altissimo – initially practice this with long tones, then work it into scales, melodies and your soloing. Scooping – this can be done with your jaw or fingers. Ghosting Notes – this is when you put your tongue on the reed, but the note still speaks. Learn music theory. Take a class or read a book. Want to learn more about the music business? Check out our popular FREE eBook – Advice for Young Musicians: From Established Music Professionals. We’ve compiled a short collection of tips for the advanced saxophonist (someone with two years or more of experience). If you feel anything is missing from this article, please feel free to let us know in the comments! 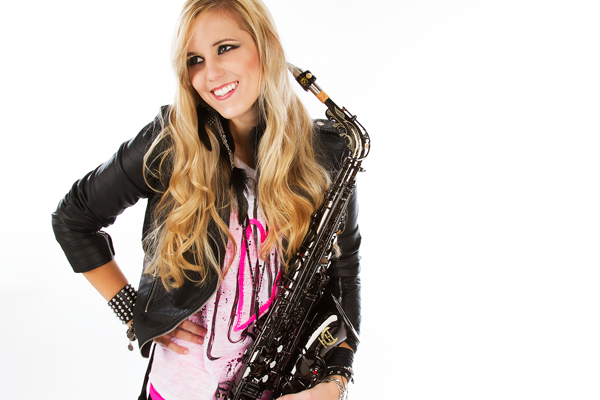 You can also read our tips for the beginning saxophonist here. What should you keep in your saxophone case? The same goes for you as the beginning student, you need the same things in your case, and so you don’t have to go back and read that article again, I listed them here as well. Your saxophone (I know this sounds obvious, but I have known kids that forget parts of their saxophone at home or brought the wrong saxophone case and the sax was in the other case back at their house), your saxophone neck, a mouthpiece, a ligature, your ligature/mouthpiece cap, a neck strap, and 2.5 or size 3 reeds (aka medium or medium soft). But sometimes, by this stage, you have found that a harder reed has worked for you and you might want a 3 or 3.5 (medium hard). Make sure that you keep several GOOD reeds in your case. It is extremely frustrating for a band director when you break a reed and it was your only one. I also recommend that you keep a cleaning cloth in your case, something to store your reeds in, powder paper or a dollar bill to fix sticking pads, and something to dry out the inside of your neck and mouthpiece after you are done using them. I also keep electric tape in my sax case for quick fixes and to put on the top of my mouthpiece to make it more comfortable for my teeth instead of buying the little plastic stickers. Lastly, I recommend that you keep a small screwdriver in your case. At this stage, you should be able to start doing small repairs on your sax when screws and things begin coming loose. It might help to keep screwdrivers of a couple different sizes – and they should be flathead screwdrivers. When you play, you should sit up straight and play with your sax between your legs unless you play tenor or bari, then you should play with your sax off to right of your legs for support. You should know the circle of fourths or fifths. You should know your major, minor, blues, dominant or mixolydian, and dorian scales on the full range of your instrument at the least. As far as soloing, you should have a basic idea of what to play. You should know how to read chord changes, and know your scales. You should recognize blues in Concert F, Bb, and C (that is D, G, and A for Eb instruments and G, C, and D for Bb instruments). You should recognize rhythm changes. Also, you should be able to recognize several jazz standards and have a few standard melodies memorized. It also would help to own a Fake Book or Real Book. You should be able to read music, know basic and some more complex, syncopated rhythms, and how to tongue. Tonguing is a real issue with young players because they either do not know how to tongue and attack using just air, or tongue way too hard. You should be able to recognize that your saxophone is in Eb if you play alto or bari, and Bb if you play tenor or soprano. You should also begin being able to transpose from concert pitch to the key of your instrument and vice versa. As far as listening, you should listen to more jazz (if that’s the genre you’re interested in), and be able to recognize several musicians’ names, especially those who play your instrument. You should know names like Michael Brecker, John Coltrane, Charlie Parker, Wayne Shorter, Cannonball Adderley. As far as non sax players, you should know names like Duke Ellington, Miles Davis, Louis Armstrong, Ella Fitzgerald, etc. You should own a few if not several jazz CDs, and have a jazz radio station that you listen to regularly. In addition, you should have begun to start to try and play along with your recordings, and to transcribe some of your favorite solos. You should have a regular practice routine that includes scales, long tones and tuning, and working with a metronome. It also helps to have both classical and jazz etudes to help you with phrasing and technical ability. Books that I recommend are “Patterns for Jazz”, the Charlie Parker Omnibook, and the Neihaus etude books. I also think that you should study privately on a weekly basis and also follow the instructions that your teacher gives you for practice. The last, but most important thing I recommend is to go out and see live musicians play jazz. It helps you to see what it is like playing as a professional musician, and you also get to hear great music. Usually, there are local venues and restaurants that have live jazz groups perform that you can go see as opposed to spending a fortune to go to a jazz concert at a theater. Both are great, but very different, so it is up to you to choose which you want to attend. I recommend both, and would go to both if you can. Want more tips on what it takes to be a great musician? 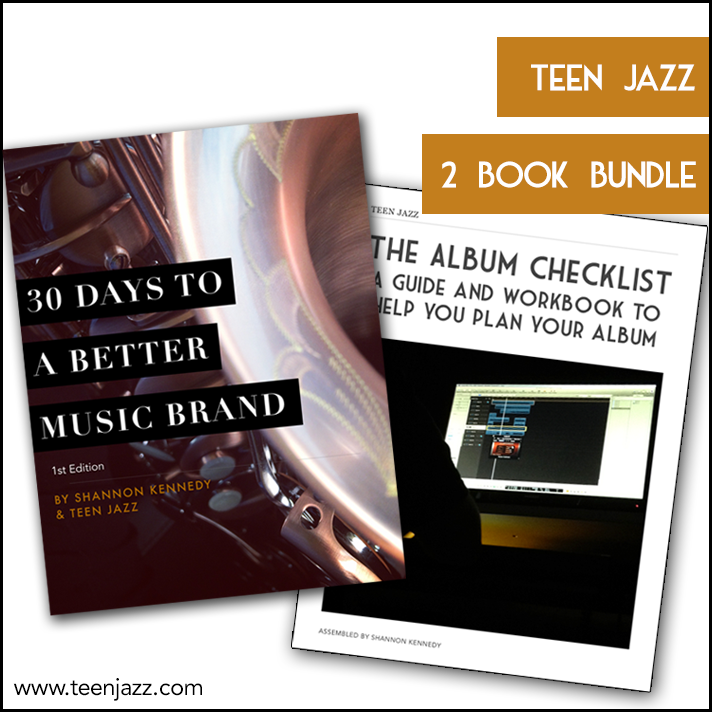 Check out our popular FREE eBook – Advice for Young Musicians: From Established Music Professionals. We’ve compiled a short collection of tips for the beginning saxophonist (someone with two years or less of experience). If you feel anything is missing from this article, please feel free to let us know in the comments! 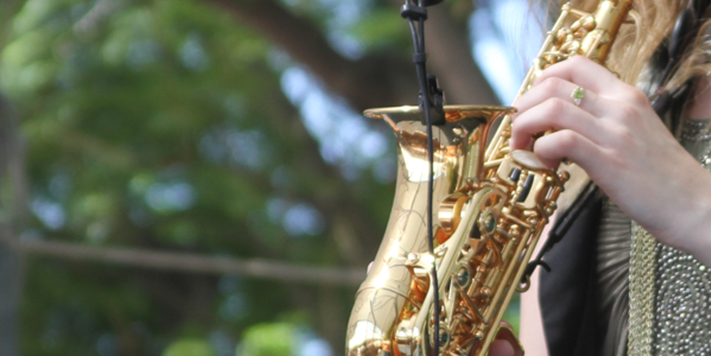 You can also read our tips for the advanced saxophonist here. What should you have in your case? Your saxophone (I know this sounds obvious, but I have known kids that forget parts of their saxophone at home or brought the wrong saxophone case and the sax was in the other case back at their house), your saxophone neck, a mouthpiece, a ligature, your ligature/mouthpiece cap, a neck strap, and 2.5 or size 3 reeds. Make sure that you keep several GOOD reeds in your case. It is extremely frustrating for a band director when you break your only reed. I also recommend that you keep a cleaning cloth in your case, something to store your reeds in (the plastic protectors they come in should be sufficient, just remember to put them back in after you play), powder paper or a dollar bill to fix sticky pads, and something to dry out the inside of your neck and mouthpiece after you are done using them. I also keep electric tape in my sax case for quick fixes and to put on the top of my mouthpiece to make it more comfortable for my teeth instead of buying the little plastic stickers. When you play, you should sit up straight and play with your sax between your legs unless you play tenor or bari, then you should play with your sax off to right of your legs for support. This also can depend on your height – if the alto is between your legs and your right wrist touches or is below your leg, you need to play off to the side until you grow a bit more! Learn your major and minor scales at least one octave, two if you’re ambitious. You should learn what the circle of fourths or fifths is (especially if you want to play jazz). It will help you learn key signatures as well. You should be able to read music, understand basic rhythms, and know the proper way to tongue (or at least be on the way to doing so). Tonguing is a real issue with young players because they either do not know how to tongue and attack using just air, or they tongue too hard. You should be able to recognize that your saxophone is in Eb if you play alto or bari, and Bb if you play tenor or soprano. Once you’ve been playing a year or two, you should also begin to learn how to transpose from concert pitch to the key of your instrument and vice versa. Research Adolf Sax, the man who invented the saxophone. Learn about and recognize names of famous sax players such as Charlie Parker, Cannonball Adderley, and John Coltrane. You should explore different types of music that feature the saxophone (jazz, blues, fusion, and even some pop). Listen to at least one jazz station or classical station occasionally if not regularly. You should also begin listening to professional saxophone players so that you can eventually try to emulate what they play and sound like. In addition, you should be able to recognize names of other important musicians such as Duke Ellington and Miles Davis. This article is part of a series of repair articles written Rheuben Allen. 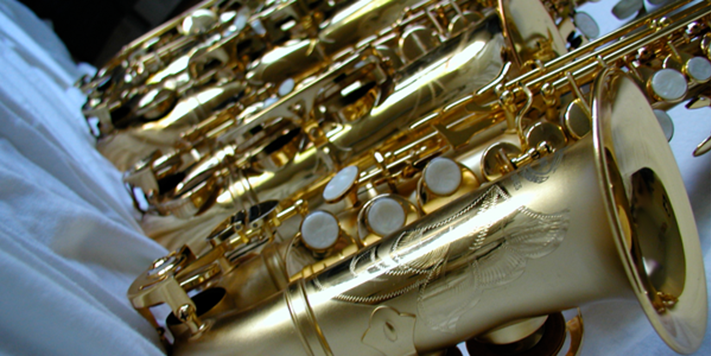 Here are a few tips for basic saxophone repair. In order to remove the bounce in the low C key of a saxophone, you must first move the spring out from under the arm of the key. Next, cut a small slot in the key. Make sure that the slot is not too deep. Adjust the spring and place it in the slot. This changes the pivot point of the spring and does not allow the key to bounce as much. The G# and the low C# keys on the saxophone have a tendency to stick. The reason that the G# and C# keys stick is because the pad is closed against the tone hole, and so, whenever someone drinks anything other than water or eats before they play, they are contributing to the build-up on the pad that causes the key to stick. 2. Have the spring tension adjusted so that it is as strong as possible without making the G# or C# difficult to finger. 3. Change the direction of the spring. Leverage is very important to the operation of the G#. 4. Replace the blue steel spring with a stainless steel spring. The stainless steel spring works differently than the blue steel and seems to have more tension. 5. Brush your teeth and tongue before playing your instrument. This article has been taken with permission from Rheuben Allen‘s website.